When half of your employees say their work environment is too hot, and the other half are saying it’s too cold, you can be reasonably certain you have the temperature set just right! However, invariably the extreme variances in Australia’s climate makes for substantial challenges in providing an ambient workplace, where everyone is comfortable. 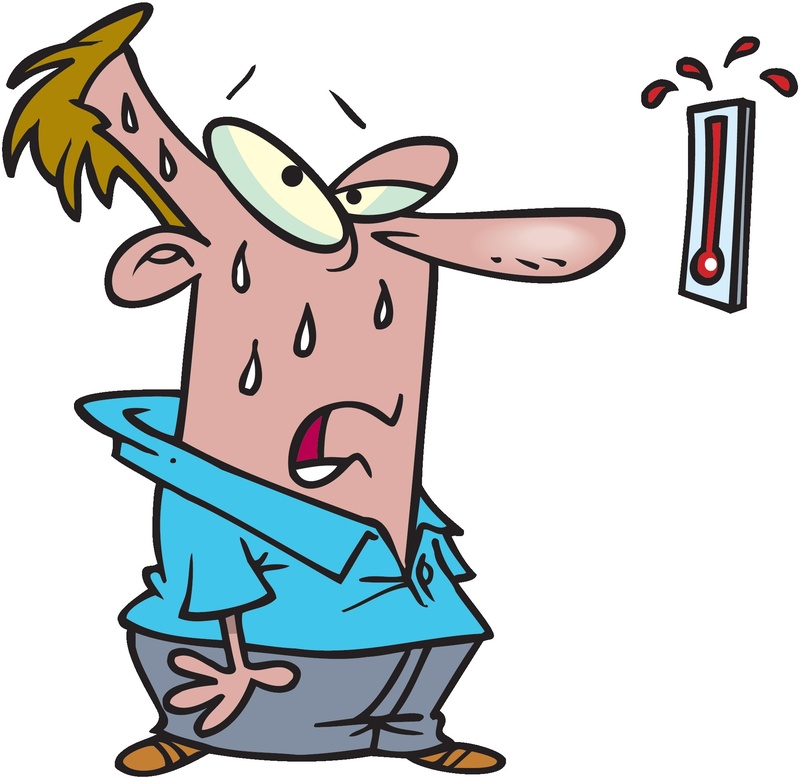 But what is the law around temperature control in the workplace and is there a maximum and minimum temperature that employer’s need to consider? Temperature extremes are a known hazard – from freezing to burning, heat or lack of it can seriously harm people. Obvious hazards are easy to identify, but when it comes to the temperature merely causing discomfort, it’s less straightforward. Means of controlling atmospheric conditions, i.e. temperature, radiant heat, and air velocity. Individual factors, such as age and build. 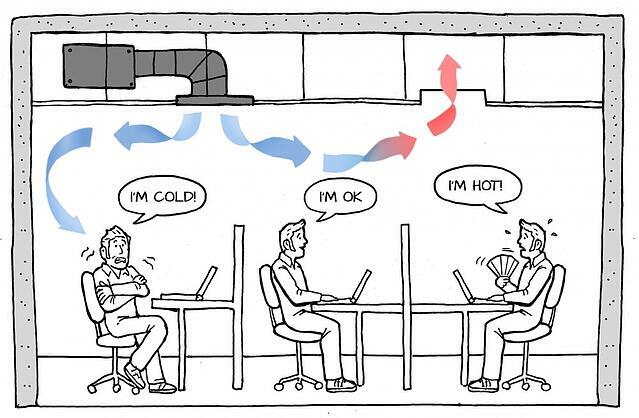 In Guidelines for the Provision of Facilities and General Safety in Commercial and Industrial Premises, the MBIE recommends that the temperature range providing thermal comfort for most people is 18-22°C (sedentary work) or 16-19°C (physical work) during winter and 19-24°C (sedentary work) or 16-21°C (physical work) during summer. The recommended relative humidity for workplaces is 40-70%, and the air speed should be 0.1-0.2 metres per second (without creating a draught where sedentary work is carried out). Employees should not be directly exposed to radiant heat and they should wear clothing that is appropriate for the time of year. 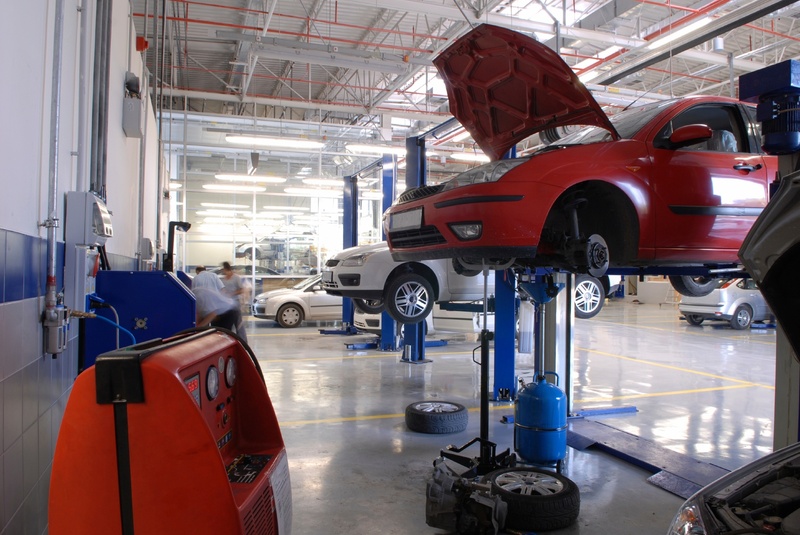 Temperature control in car servicing and automotive workshop areas is commonly forgotten as well as those who work in a workshop environment. Not only is temperature control important for staff safety and comfort which could improve their efficiency at work and general happiness, but workshops and the automotive industry in general has a number of hazardous substances and processes which affect the air quality and can raise the indoor temperature. For ventilation purposes, it has been suggested by WorkSafe that “Engine bay doors should be fully open at all times. If weather conditions prevent this, the work must be evaluated and tasks such as spray painting, which could result in a build-up of fumes, should be postponed”. Petrol containers and gas cylinders: These are highly flammable substances and could cause fatality and serious injury if not carefully handled and stored. Spray paints: Inhaling paint fumes may cause occupational asthma. Long term exposure can affect the brain, damage the reproductive system and cause kidney or liver damage. Contact with the skin may cause dermatitis (an inflammation of the skin). Carbon Monoxide: Carbon monoxide (CO) is a highly toxic gas produced when fuels burn incompletely. The typical internal combustion engine used in most cars and trucks, can produce extremely high concentrations of carbon monoxide and we cover this in more detail below. 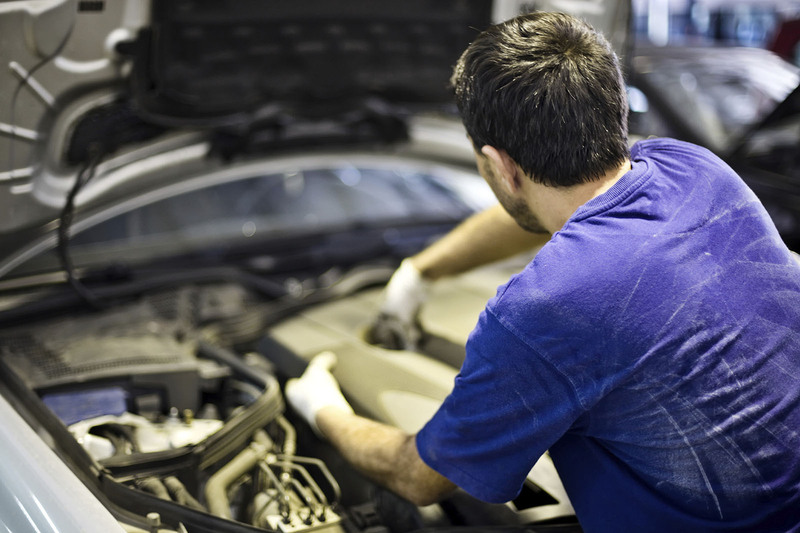 With all of these factors - good ventilation is absolutely essential in automotive workshops not only for the safety and health of workers but for their comfort. Although we start to face an issue with doors being left open during the winter and although this may assist with the ventilation of the area, the comfort of workers starts to deteriorate. Automotive workshops have a number of challenges when it comes to their Engine bay doors, commonly, steel roller shutters have been installed at these sites as they are low cost and big enough to allow for vehicles to come and go throughout the day, but keeping such a large door open throughout the day can become uncomfortable for workers in conditions such as the winter (and summer where hot air is flowing into the building). We know that steel roller shutters – even when they are kept closed, provide no insulation against outside weather conditions. Steel roller shutters are renowned for absorbing the heat in the summer and transferring the winter chill in the winter, providing no insulation value at all. 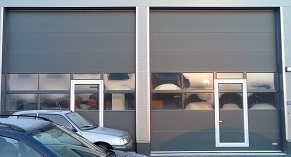 This may not be a problem for a home garage, but for a workplace such as an automobile workshop or professional car servicing garage where staff are expected to work within the garage all day, it becomes intolerable when the indoor temperature fluctuates directly in proportion with the sun or winter chill’s effect on the external doors. 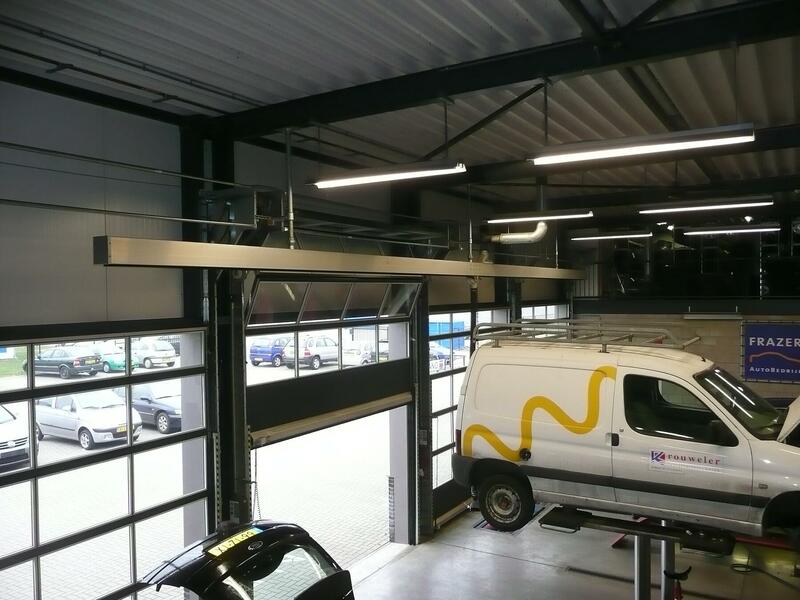 As the manager or owner of an automobile workshop or professional car servicing garage, the efforts (and costs) of trying to maintain the temperature of these areas with uninsulated steel roller doors as the main entry, is painful when the shutters are working against you. With a better insulated option, not only will your staff be happier and more comfortable, but also more likely to work efficiently, whilst saving you costs in heating/cooling. Compact Sectional Doors are a great alternative to Steel Roller Shutters in this regard. The Compact Aluminium Sectional door is the premier alternative to roller shutters, or conventional sectional doors. The Compact door is a sectional door which needs no intrusive overhead support rails to be attached to the roof structure, and utilises a unique folding action to push the door leaves into a compact space above the doorway. 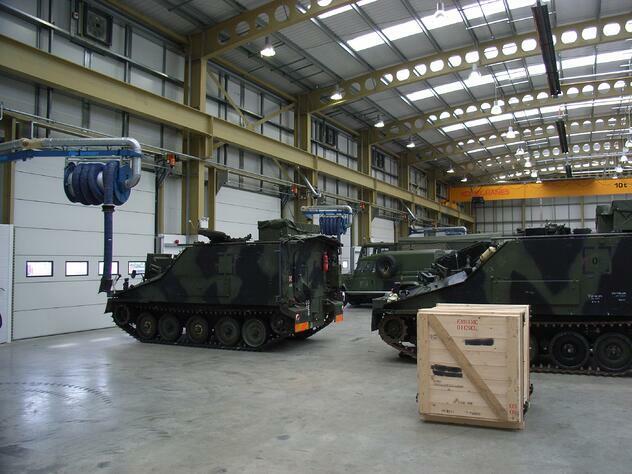 Compact Sectional Doors have been successfully implemented in various environments including car showrooms, factories and warehouses, cold storage, wash bays, processing lines, emergency department including Ambulance and Fire Department, arenas and pavilions, loading docks, marina's, large agricultural buildings and depot. Compact Sectional Doors are made bespoke to your environment and entry, in both panel requirements (whether you require panels that are; thermal, PVC, double-glazed acrylate/polycarbonate/reinforced safety glass, mesh) as well as the opening size, from your average garage door opening size to a large warehouse requiring access for heavy machinery and vehicles such as aeroplanes, cranes and Fire Engines - see the Melbourne Market Project where large scale thermal compact doors were installed for access to various fresh food areas by large delivery vehicles. Locking Options consist of anti-lift protection provided as standard.